Sony comes up with a sharper, faster and water resistant Xperia Tablet Z, which is now available for pre-order with shipment scheduled for May 24th. According to Sony it is the world’s thinnest 10.1″ tablet, with a highly durable dust and water resistant design that lets you enjoy it practically anywhere. For razor-sharp video and bright, lifelike photos, the Xperia Tablet Z’s screen takes advantage of Sony’s world-renowned display technology. And it’s just as impressive on the inside, with a quad-core processor for blistering speeds and jaw-dropping graphics. There’s even a One Touch feature that lets you transfer content wirelessly to your NFC compatible TV, smartphone or speaker with a simple touch. 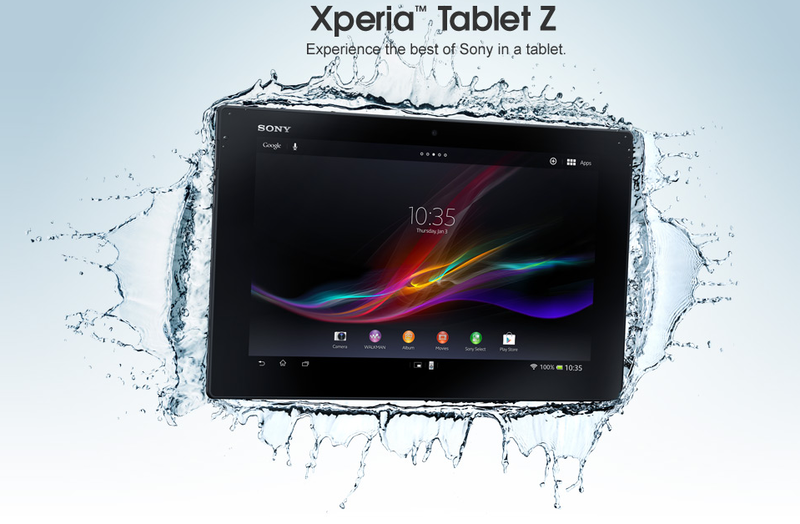 Introducing the water resistant, ultra-light tablet boasting the best of Sony. Get double the storage on an ultra-light tablet boasting the best of Sony. * Free cradle with purchase of a white Tablet Z, a Sony Store exclusive.